Sidisi, Brood Tyrant ($0.00) Price History from major stores - Prerelease Events - MTGPrice.com Values for Ebay, Amazon and hobby stores! 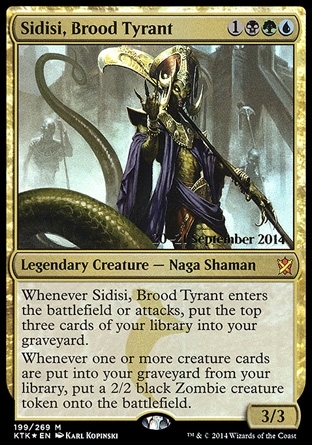 Card Text: Whenever Sidisi, Brood Tyrant enters the battlefield or attacks, put the top three cards of your library into your graveyard. Whenever one or more creature cards are put into your graveyard from your library, put a 2/2 black Zombie creature token onto the battlefield.